-Priced below the market average!- Navigation, Back-up Camera, Bluetooth, This 2015 Dodge Dart GT, has a great Pitch Black Clearcoat exterior, and a clean Black interior! 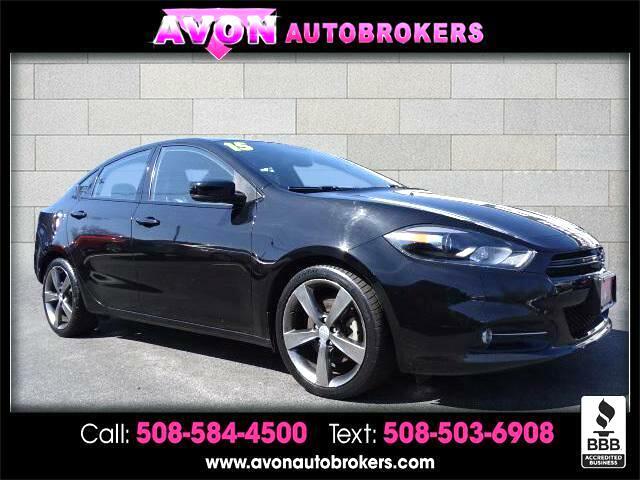 Heated Seats, Auto Climate Control, Leather Steering Wheel Satellite Radio, Steering Wheel Controls, Sunroof/Moonroof, Seating, AM/FM Radio This Dodge Dart gets great fuel economy with over 33.0 MPG on the highway! Park Distance Control ABS Brakes Satellite Radio Front Wheel Drive Call to confirm availability and schedule a no-obligation test drive! We are located at 159 Memorial Drive Rt.28, Avon, MA 02322.